Midday is not normally the best time to photograph anywhere. 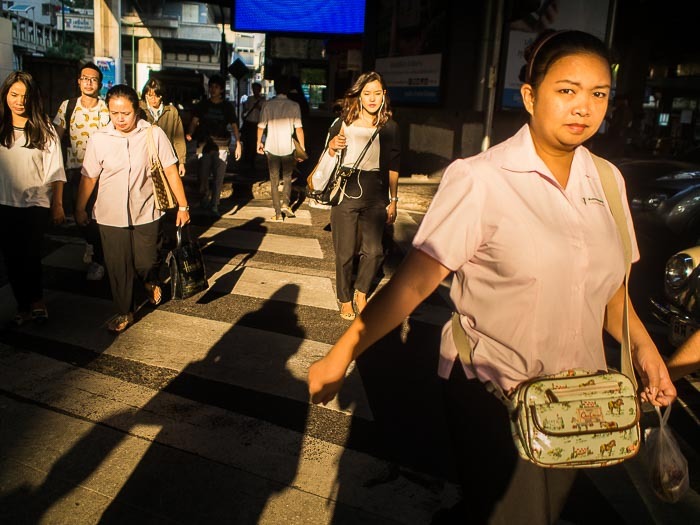 The light is directly overhead, shadows are hard to penetrate and, at least in Bangkok, it's usually really hot. 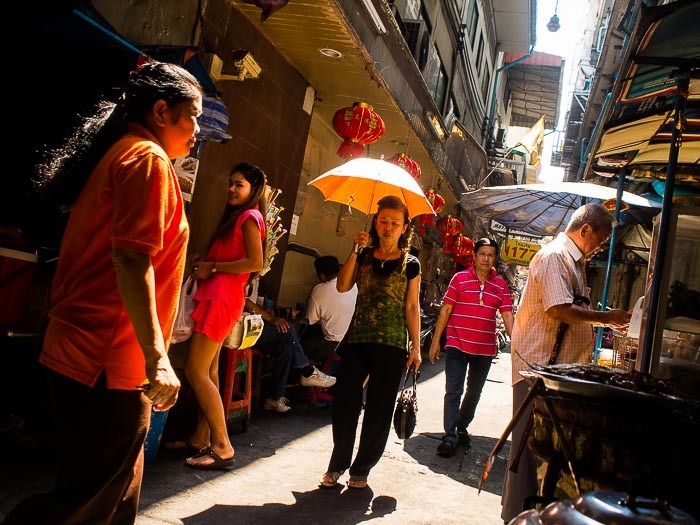 On a recent trip to Chinatown though I was struck by how many elements lined up on a narrow soi. Despite the bad light, or maybe because of it, there's a lot going on in the photo. The woman in orange on the far left matches the parasol held by the woman in the center. The woman in the reddish dress center left picks up the color in the Chinese lanterns over the sidewalk which leads to the man in the magenta shirt center right. And it's all anchored by bluish umbrellas on the right. I might be reading too much into the whole thing but what I initial thought didn't work is growing me. 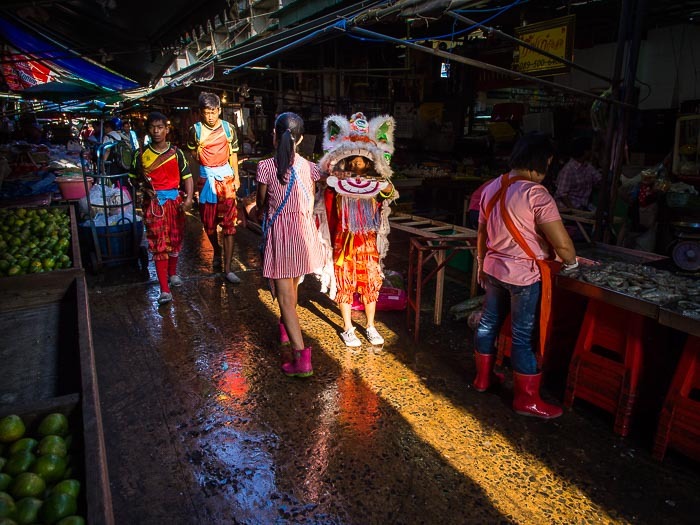 In Khlong Toei market about 9AM, late by Khlong Toei standards, a shaft of sunlight penetrated the roof of the market and the awnings of the market vendors to provide a path for lion dancers to follow. I ran into a similar scene in Khlong Toei Market. I was photographing the fishmongers in the deep shade and heard the lion dancers' gong. I turned around and made a couple of frames of them walking through the market. Pedestrians on Phloen Chit Road where it becomes Sukhumvit Rd walk due east into the sunrise. Phloen Chit Road, where it goes under the expressway and becomes Sukhumvit Road, is one of the busiest intersections in Bangkok. Traffic coming off the expressway merges onto the surface streets. The Phloen Chit BTS discharges a steady stream of passengers and people from nearby hotels and offices jostle for position crossing the street. Normally the area under the expressway is a dark void but at just the right time - for around 30 minutes right after sunrise (about 7AM at this time of year), the light penetrates the chasm and people cross into the light. I've found the trick to photographing in this light is too underexpose the scene. I wanted to hold detail in the highlights and let the shadows go black so in each case I set the meter on my E-P5 to underexpose by at least one stop.